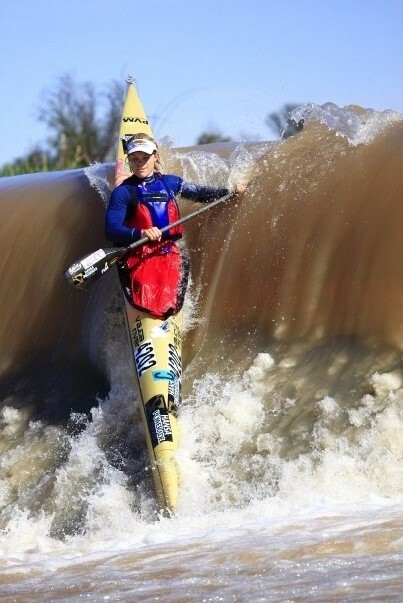 Along with some pretty incredible people, I have been nominated for a World Paddle Award in the Foundation category. You can find out more by clicking on the logo above, and you can also vote for me, or any of the amazing nominees, by clicking the Facebook “like” button or the big “thumb’s up” at the end of the article. The voting ends on November 20th, and the winners get to attend the awards ceremony in Portugal in February next year. The World Paddle Awards (WPA) is a fantastic concept and the event is held annually, “celebrating the most remarkable men and women from the world of paddlesports along with their achievements from the previous calendar year.” Click on the image below to find out more about the WPA. Since the Olympics has come and gone, I have been hard at work setting up the next exciting venture. Our business Paddle California, which also has MultiCoach operating under the PC umbrella, has some fantastic offerings in the works. More on that to follow. I am in South Africa at the moment. 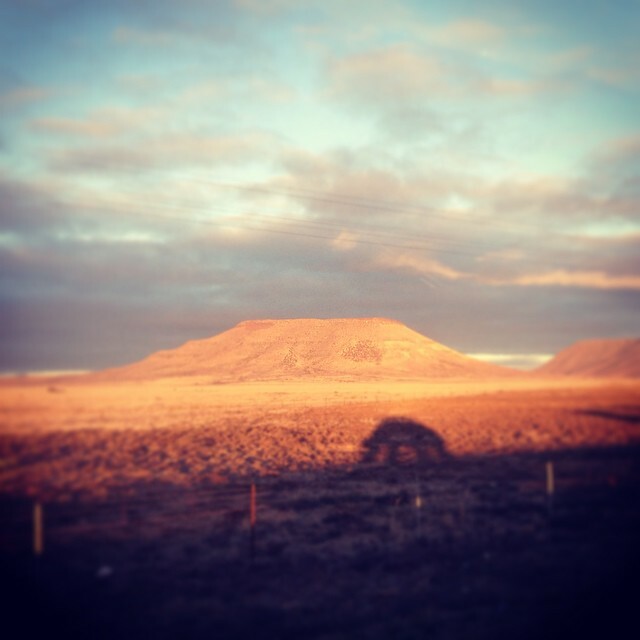 So fantastic to be home, especially with the craziness of Spring. Been a while since I was home this time of year, and I am thoroughly enjoying myself. Out with an injury, so unfortunately missing out of all the great races I planned on doing (Fish, Pete Marlin, Cape Point Challenge etc) but glad I am here where I have some great rehab people! Thanks for reading, happy paddling! Sitting in Oklahoma City last year, watching the race unfold via twitter feed, I definitely knew I would not let this year’s Fish River Marathon slip by without me being on the start line! The whole experience is uniquely South African, from the arid and beautiful Karoo/Eastern Cape landscape, to the brown river winding through koppies and thorn trees, to the crazy river paddling culture. 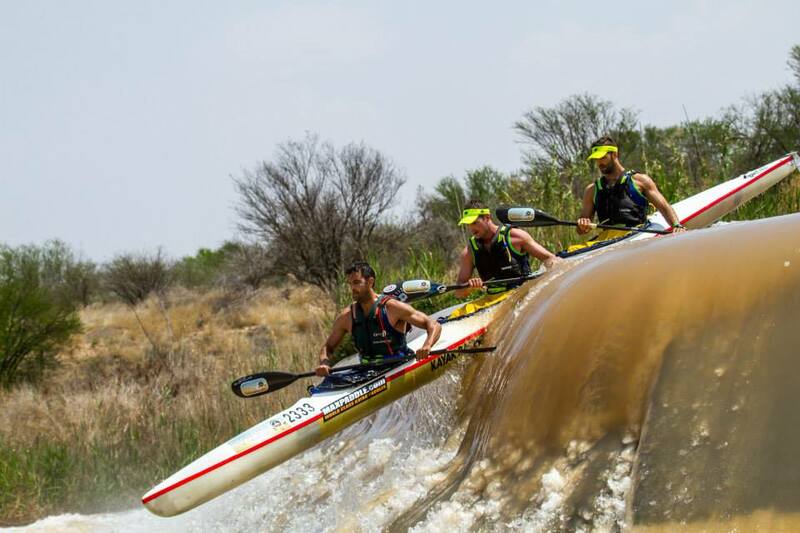 Not many countries in the world have a race where paddlers navigate seriously challenging raids in ICF-style racing K1’s and K2’s (this year even served as National K3 Championships!). The vibe is unlike any other race I have done, and definitely one to add to your Bucket List. I lined up for my 9th start in 20 years of paddling the river, anxious as the last time I had been on flowing water was the 2012 Fish! Nonetheless, I had a super fun 2 days with no swims, and felt really solid in my great Vantage K1 from Knysna Racing Kayaks. Toastrack Bridge-Gotta bend low to miss smacking your noggin on that! 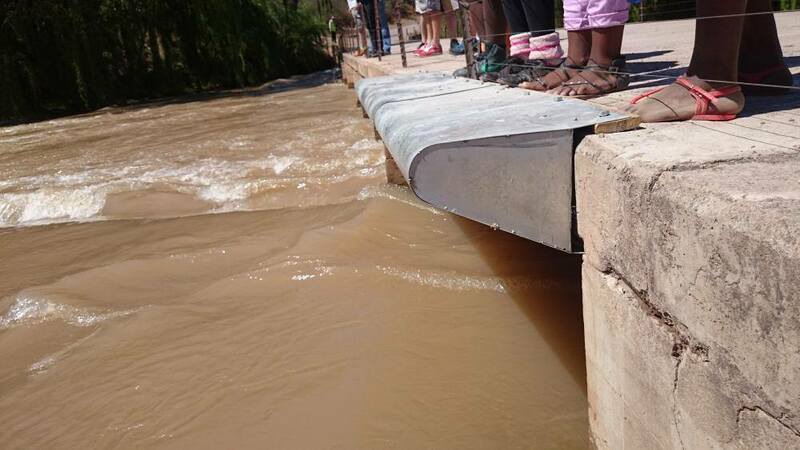 With a rather large buffer between myself and 3rd place, I had the luxury of portaging Cradock weir to avoid any chance of a mishap, although missing out on the thrill of that drop was a rather large sacrifice to make to ensure my race position. The event organizers chose to do a reverse order start, giving all of us racing in elapsed time and A batch a much appreciated lie-in, as we only got going at 1030AM. The idea was to have a bigger crowd of supporters at the finish when the race winners came in. 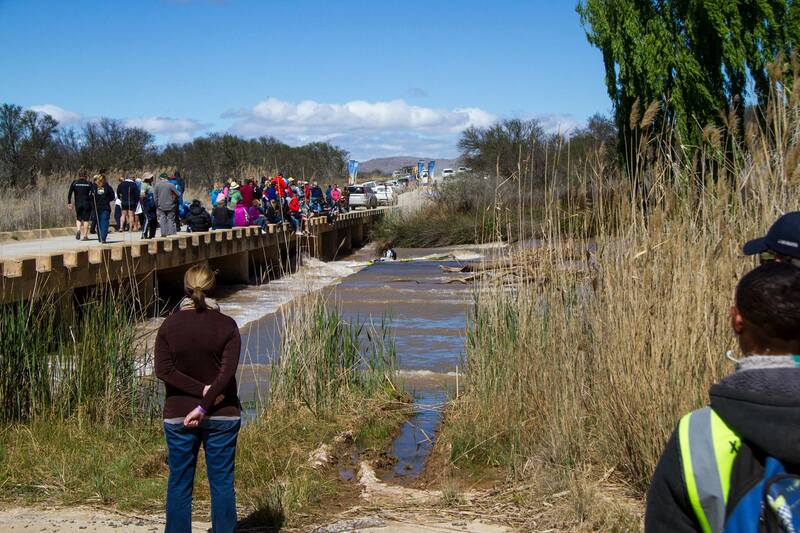 I think I refer the earlier start rather, as a highlight of the race is going to Cradock weir after I’m done, and watching the masses shoot it. With 2 nights of local South African bands playing, the whole weekend package is totally worth the trip. Next year’s dates have been set, and unfortunately it looks a little tight to be able to make the trip back to SA from Tahiti, who is playing host to the 2nd edition of the ICF World SurfSki Champs. I have a few more days here in my beautiful hometown Plett, and then it’s back to Oklahoma City! 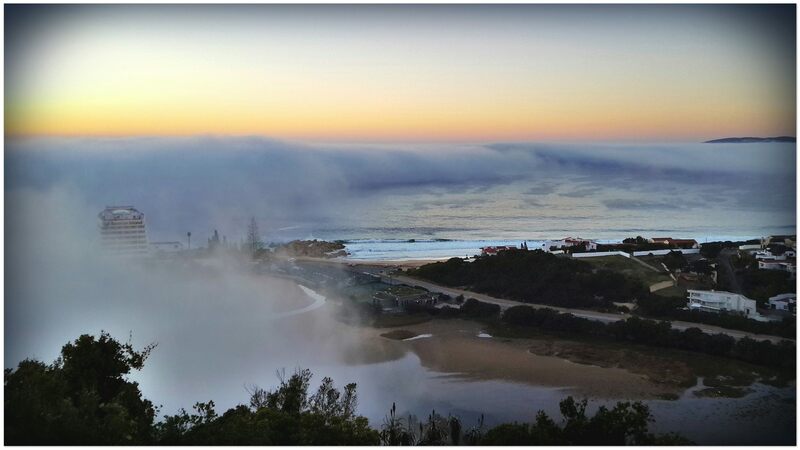 The past few days the onshore wind has been blowing in Plett. Unfortunately a SE means only one thing… Blue Bottles. The one really good thing about the onshore wind is that it makes for super fun paddling conditions! 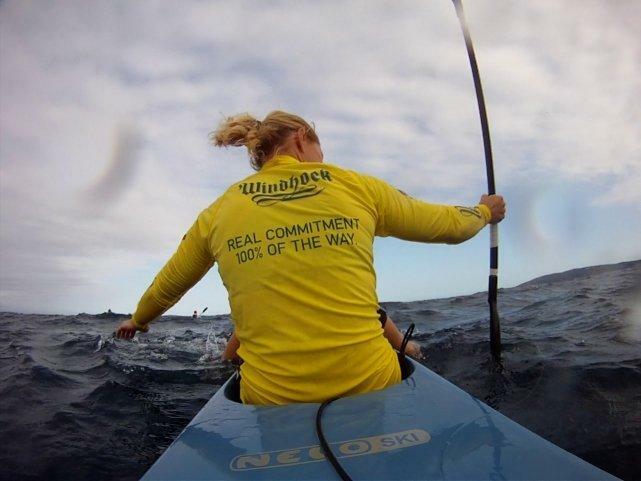 We paddled a super out and back with the wind paddle this arvo, I will post the footage soon. Here is the photo sequence of me managing to (unknowingly) fling one particularly long bugger over my head, and snag it on my ear, and then wrap it around my paddle and arm! Getting it off is a tricky business. You don’t want to touch the blue string as it will burn you! 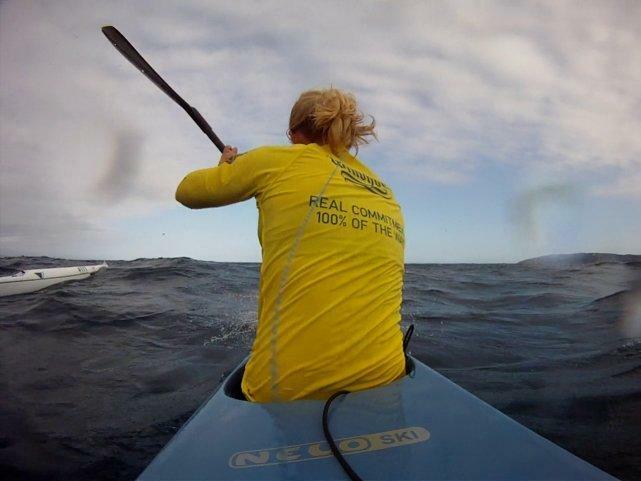 You have to at some point, and balancing a tiny surf ski in the wind with no hands on your paddle is a sport within itself! Now flicked it over my head and snagged on my ear! Now the really tricky part, getting it off my paddle without getting stung again, and taking a swim in the deep blue sea! I find the best treatment for Blue Bottle stings is ice! 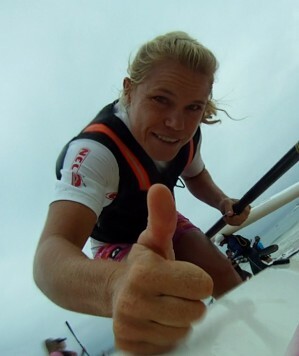 AeroCam Video from Plett Easter Ski Race-very cool! 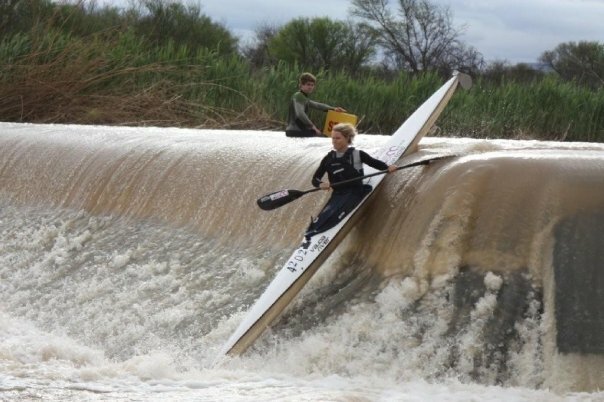 Easter weekend in the East Cape involves a lot of paddling. First up is Good Friday, and the Nelson Mandela Surf Ski Classic in Port Elizabeth, which forms part of the Splash Festival. This always promises to be a tough one, as the conditions are generally flat, and there are these tiny little bumps that just beg to be chased, leaving you exhausted to complete the 26km course. With a cold front passing through there just the day before, there was a great left over swell, and Mike Zoetmulder reversed his usual course, allowing us to surf the waves back from the Boiler Reef, which made the race a whole lot more fun! I won my 3rd in a row, and am starting to love my collection of “penguin” trophies. (Will post a photo soon). After a quick 230km back home to the Land of Milk and Honey I got a great sleep in before the 1pm start of the Pennypinchers Easter Surf Ski Challenge which formed part of the Plett Easter Games, a weekend full of sporting activities, including trail running, mountain biking and more. Fortunately the river mouth had calmed down by Saturday, and the course involved 4 laps from Central Beach to Lookout, with laps 2-4 going in through the river mouth, around a can and back to Central. Most races these days are lap-style courses, which tend to get pretty boring. The great thing about the Plett course is that there is a bit of everything, surf, small runs, headwind and chop. Enough to keep it interesting and make the 22km feel shorter than it is. On the last lap, just after passing the Blinder rocks, a Mako shark jumped about 50m from us! Crazy heart rate surge followed, almost like popping one of my PVM Octane Gels that have 100mg caffeine in them! I had a great race, and felt strongest in the middle section, and loved racing all the Plett guys I train with! As part of MultiCoach, my online training and coaching business, I took local cyclist Erik Klootwyk, and taught him to paddle, as well as squeaking out some fitness training, just enough to get him to complete the 22km course in just over 2h30! An amazing feat, and I am sure he is as stoked as I am. The interesting thing is that he has mentioned how his core strength has increased so much that he is feeling better on the bike now! Bonus! Click on the Zero2Hero logo to find out more. Around the Point, and on to the Island. It was pretty choppy on the “Wild” side of Robberg, as usual, with lots of rebounds. Once in at the Island, a quick run around the flag and back out to the Point and home! I forget how amazing this paddle is. And that was that, another great weekend in Plett, with way too much chocolate! Right now a massive storm has hit Plett, the temperature has dropped, and it feels like there is snow on the mountains. My “big mileage” week is losing momentum, I better go get cracking on the ergo instead! It’s been a quiet few weeks since my break. I have been slowly building up my fitness, and now it’s time t race again! I will be using these race as part of my training week, as my Threshold Sessions, as I am nowhere near ready to race just yet! 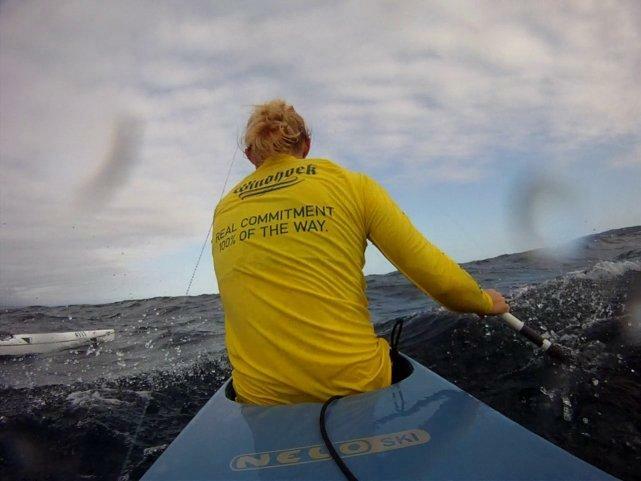 On Friday we will be in PE for the Nelson Mandela Bay Surf Ski Classic (http://www.madiba-classic.co.za/) This one always is a toughie, as it’s usually pretty flat, with these small bumps that just ask to be chased, leaving you pretty exhausted with not much help. Then on Saturday we head back to Plett for the lap style, though-the-river-mouth Penny Pinchers Plett Easter Surf Ski Race. And then on Sunday we race the Doubles event. Looking forward to some suffering!! My 2 weeks of R&R are coming to an end… It has been great to relax and not try and fit life inbetween training sessions! I definately have missed training though, and am pretty excited to get back out there. I have managed to do a few beach and forest runs, Splash has been able to run 2.5km comfortably. I don’t want to run him too much as he is still young, so he mainly has been walking! Which he loves too. Next up is SA Champs in East London. The Border Canoe Club guys have promised a great event so make sure you don’t miss out!